IPOB: OSINBAJO YOU CAN'T STOP BIAFRA, NIGERIA MUST BREAK ! 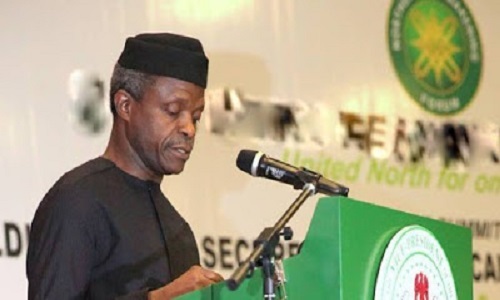 My attention has been drawn to a press statement credited to the Vice President of Nigeria, professor Yemi Osinbajo during a visit by the Arewa consultative forum (ACF) which stated that "Nigeria is better as one country and so cannot divide." It is actually unbelievable, pathetic, and conspicuously unreasonable of Nigeria politicians, in this case Vice President Yemi Osinbajo, that despite all the obvious proofs staring at their faces that Nigeria being a dungeon of inorganic combination created out of greed is not a Nation but a mere geographical expression and experiment of the British colonial masters. These evil men filled with greed and egocentricity have continued to call black white, to act oblivion of the present situation in this failed Nigeria state which they tend to dubiously maintain its unity at every opportunity that comes their way and thus frustrate and demoralize all the efforts of IPOB towards Biafra restoration. However it is unavoidably important to set the record straight here by simply answering these questions: How can the greatness of a country such as Nigeria rest in it's diversity or in size with no agreement in culture, traditions, religion, value system, etc? Is it not true that Nigeria politicians are ignorant of international laws of human rights and self-determination? It is however regrettable and disappointing that they claim to be educated and are leaders in Nigeria, but in their speeches, policies and actions they wallow in backwardness and primitivity comparable to the stone age. Unfortunately, these so called "leaders" are ruling in an advanced world such as ours today. Can Vice President Yemi Osinbajo mention one nation in the world that are succeeding with three divergent value systems? These are bunch of hypocrites whose personal interests and that of their British master supersedes the general well being of the indigenous communities that make up the song called Nigeria. Mr. Vice President, talking about coming together to forge ahead, the question I choose to ask is: how long does it take a country to unite? Since the 1914 amalgamation and 1960 Independence till date which is over an 100years, they are still talking about coming together and forging ahead with no social amenities, such as electricity, safe drinking water, good accessible roads, quality health care system, including jobs, quality education, etc. Rather all that is present is corruption, victimization, marginalization, economic emasculation, frustration, poverty, deprivation, environmental degradation, political disenfranchisement of the South East and South South (BIAFRA) and the killing of Christians. Again, if Nigeria is one as claimed by Vice President Yemi Osinbajo why then are they always begging for Unity? Now on the issue of Buhari being committed and passionate to preserve one Nigeria, I must say that it is humorous and despicable at the same time. How do you intend to unite a country by placing an embargo on a particular part of that country not to head any important political office? Do you unite a country by arresting, detaining, killing innocent peaceful protesters for asking for their rights? Or do you unite a country by going against your own Constitution, detaining the leader of indigenous people of Biafra (IPOB) Mazi Nnamdi Kanu and other Biafra agitators despite court orders for their release? I must unapologetically state here that Nigeria is truly a fraud! Muhammadu Buhari is actually a Wolf in sheep's clothing who was quick to congratulate Turkish government after a successful democratic referendum, conducted to decide people's fate and settle their differences. But when it comes to Biafra agitation for self determination, he, Muhammadu Buhari ordered his murderous security agents and battalion of combined forces to roll out armoured tanks, artilleries, machine guns, etc to kill and maime unarmed innocent and helpless Biafrans. I wonder why a black man will be clamouring for a man-made contraption (British enterprise) like Nigeria, when the truth remains that, "a territory can never be more important than the people that dwell therein." We Biafrans see Nigeria as a torn in our flesh and we cannot continue to be slaves in our father land. Whereas Nigeria stands for injustice, Biafra stands for justice equity and fairness. Once again Mr Vice President, just in case you don't quite follow, Biafra is a prophecy of which its time of fulfillment has come. Do not joke with a people that are ready to die for what they believe in. Blood is thicker than water and Biafra must be restored at all cost. Excellent piece my brother. VP Yemi Osinbajo is a hypocrite, an Hausa/Fulani slave and a coward. He’s a monkey and has no power whatever to stop God’s divine mission of the restoration of Biafra nation. The more reason united states of Biafra must be established it the incompatibility of the unit that made up the territory called Nigeria. while the VP and his Hausa Fulani cohort are use to master-slave relationship, we Biafrans are republican that while respecting the instituted authority value and recognizes individual achievement and freedom to aspire for his or her dreams. JOIN THE REFORMED OGBONI Fraternity 08053803487(THE REAL BLOOD MONEY WITHOUT INVOLVING HUMAN BLOOD). NO MATTER WHO THEY ARE,WHAT THEY ARE OR WHERE THEY BELONG JUST CALL GREAT PROPHET ALPHA 08053803487 THERE IS POWER IN POWERS. BUSINESS, EDUCATION OR IN YOUR RELATIONSHIP, OR THERE IS A CURSE THAT REIGN IN THE FAMILY. ?????? ?WE WILL VISIT YOU OVER NIGHT FOR GOOD. DONT DIAL THE NUMBER IF YOU ARE NOT INTERESTED!